Swachh Bharat: What are we missing? From the time of the PM’s speech on 15 August 2014, where he announced his commitment to a ‘Swachh Bharat’, what has changed in the WASH sector in India? Himanshu Upadhyaya shares some notes taken as a delegate at the recent India WASH Summit in the capital. Hundreds of development professionals and social activists gathered last week at the three-day India WASH (Water, Sanitation and Hygiene) Summit held in New Delhi during 16-18 February to discuss the recently-launched Swachh Bharat Mission (SBM). India has had a long history of centrally-sponsored schemes dealing with Water, Sanitation and Hygiene – starting with the Total Sanitation Campaign in 1999 and up to the Nirmal Bharat Abhiyan in 2012. Now, the new regime has launched yet another mission with a new adjective. Whether changing the adjective from ‘Nirmal’ to ‘Swachh’ impacts the realities on the ground in any way remains to be seen. However, if the statements that have been heard so far are any indication, there seems to be a strong focus on achieving targets and milestones. The central government wants to get a ‘clean India’ in the next five years. The opening plenary of the WASH meet posed the question: Do we need to keep talking about problems surrounding water, sanitation and hygiene, or shall we move towards discussing and debating solutions for Swachh Bharat? Water Aid’s India director Neeraj Jain articulated this question with a tone of urgency in his welcome note. However, he ended up voicing the word ‘consumer’ during his speech, making other speakers on the session underline this and raise questions about whether SBM is all about ‘service delivery’ or about citizens’ rights to water, sanitation and healthy living. Two voices – from two different vantage points on the political spectrum – were missed at the summit. The first one in my opinion is that of Prime Minister Narendra Modi, who had been loud and shrill in invoking Mahatma Gandhi’s message at his Independence Day speech. Those brooms may not be enough to clean our waste! There’s always one to clear your mess! The second one is that of Jairam Ramesh, whose name appeared in the programme as a speaker both at plenary session and on the second day at a session titled ‘Dignity and Justice for All: Addressing WASH from perspectives of ensuring equal access and human rights’. Ramesh’s plenary speech was to be on ‘the political economy of sanitation and evolution of the sanitation programme’. However, Ramesh was absent at the summit. Shiv Visvanathan, a social scientist teaching at the Jindal School of Government and Public Policy in Sonepat, took the stage and started his speech with a confession: he underlined that he was speaking as a replacement and told the audience that he had decided to ‘play Jairam Ramesh’, since the latter had chosen to play hockey and give the summit a miss. Visvanathan was unsparing in his very short and succinct message, reminding the audience that sanitation is critically about democracy and citizenship. He also cautioned against top-down diktats and referred to the huge contrast in terms of semantics between the words ‘cleaning’ and ‘cleansing’, especially under a regime whose basis apparently rested on the latter. Visvanathan also put the term ‘participation’ under some scrutiny, telling his audience that he loves the word since it so ‘transparently smells World Bank’, whereas social movements prefer the word ‘empowerment’. Biraj Patnaik, principal advisor of the Supreme Court Commissioner on the Right to Food Campaign, picked up threads from Visvanathan’s remarks and reiterated the question: “is this summit asking about the right to sanitation?” Patnaik requested participants not to fetishize ‘behaviour change communication’ and asserted that the politics of WASH must be both about ethics and aesthetics. Despite these voices of cautionary optimism, the three-day summit at times witnessed technical papers that were laden with acronyms and jargon. At the end of the opening plenary, I had begun to wonder if I would hear any presentation in languages other than English or see rural activists coming to the podium to tell us their stories. However, I didn’t have to wait too long as the post-lunch session on ‘Water Security for Swachh Bharat’ saw Rajendra Singh of Tarun Bharat Sangh opting to speak only in Hindi. The next day in a session on ‘Unpacking Gender-based Inequalities affecting WASH,’ Kamla Bhasin practiced code-mixing and code-switching to make her point. There were several sessions where rural women and men took to the stage singing songs of struggle and articulating their thoughts which ring very differently from the ones conveyed by statistics-heavy and jargon-laden technical papers. I was also eager to hear the innocent children who would have the courage to point out that the emperor had no clothes, and waited for the likes of them to remind us about the dismal record on Total Sanitation Campaign goals in a state that is being hyped as a ‘model of Development’. The CAG audit report also indicted the state government for having failed to implement ‘Employment of Manual Scavenger and Construction of Dry Latrines (Prohibition) Act, 1993. Merely a week before the summit, on 10 February 2015, the Gujarat High Court had directed the Gujarat government to refrain from its perpetual existence in denial mode and asked it to implement the law on manual scavenging and take all necessary steps to abolish the practice and commit to rehabilitating manual scavengers as envisioned in the 1993 law. There were voices from the audience who reminded the summit that in India, alongside the term ‘Open Defecation’, we also needed to pay attention to the continued prevalence of ‘manual scavenging’ as a forced labour practice. It was stressed that when we gather for yet another India WASH summit next year, we should already have read Gandhi along with Mulk Raj Anand to emphasise the need for ‘behaviour change communication’ as a tool to eradicate the ill of manual scavenging. 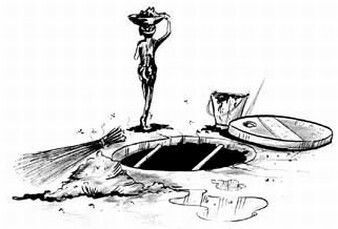 The CAG of India, in a performance review in the year 2003, had laid down an agenda for abolition of manual scavenging and had reminded the nation of the unfulfilled promises of a law legislated in 1993. The performance review had brought under the scanner missed targets and deadlines of a centrally sponsored ‘National Scheme of Liberation and Rehabilitation of Scavengers and their Dependents’. However over the three days of proceedings, I waited in vain to see if the organisers would pay any heed or even refer to the voices of those Indian Accounts and Auditing Services (IAAS) officers who had penned that audit report almost a decade back. Clearly, we are not looking that way yet. The author is a faculty member at Azim Premji University, Bangalore. Why must only the poor suffer? What’s turning women in labour away from hospitals?